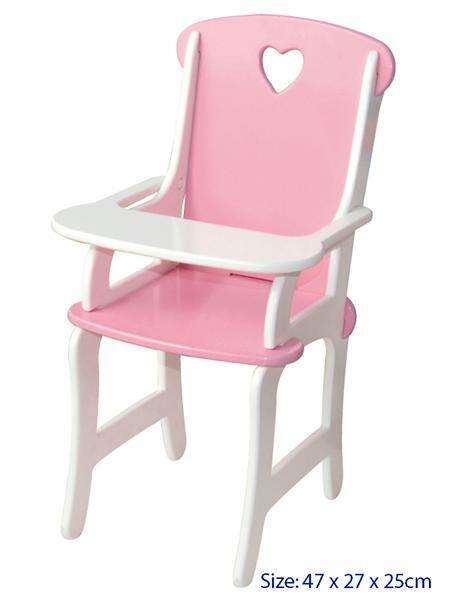 Fun Factory Wooden Dolls High Chair in Pink & White. Beautiful wooden high chair for dolls. The perfect addition to your childs play room or cubby house. This is a great little high chair, really cute in appearance, is stronger than it looks, easy to put together and a good size for little girls. My two year old granddaughter loves it, she uses the heart shaped hole as a handle to pull it around by, but is having lots of fun with it! Very happy with my purchase, thanks Baby Vegas! !